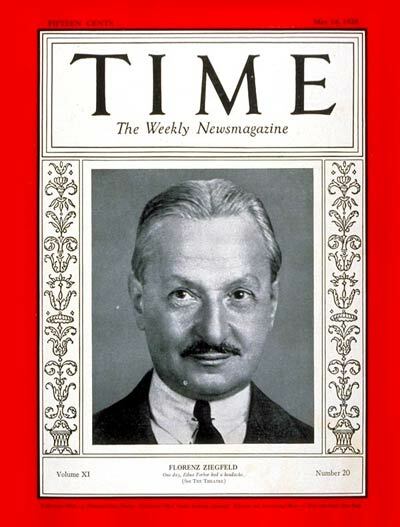 Florenz Ziegfeld Jr., who bestrode Broadway, in life and legend, for the entire 20th century, made a few forays into the movie business — especially in the last years of his life when, after a string of expensive flops on top of huge losses in the stock market crash of 1929, he tried to diversify his activities beyond Broadway and its lurking creditors. 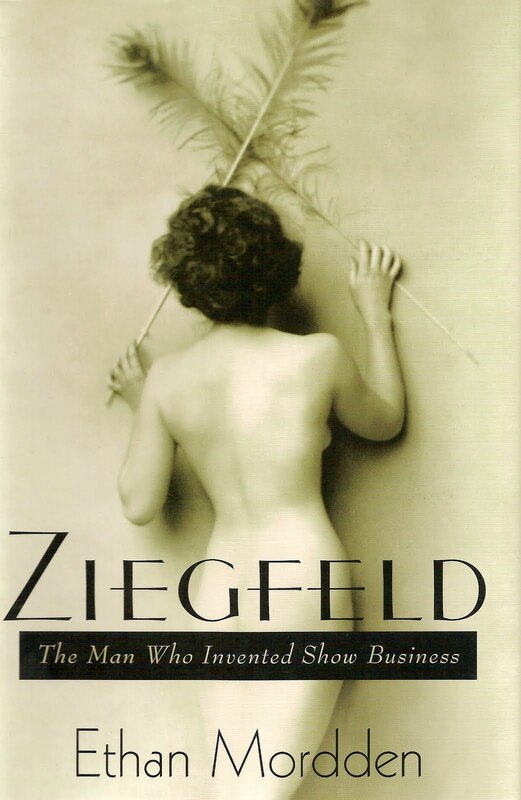 And that’s all the excuse I need to turn this post into a plug for Ethan Mordden’s Ziegfeld: The Man Who Invented Show Business. Would you like even more of a Hollywood connection than that? Okay, how’s this: You see that beauty with the peacock feathers who adorns the front cover of Mordden’s book? There is, ahem, a more complete view on the back, reproduced at right. Mordden identifies her as The Ziegfeld Girl Who Never Was, photographed by Ziegfeld’s house photographer, Alfred Cheyney Johnston, with his customary mix of glamour, dignity and eros, even though her audition failed to get her into the rarefied ranks of the Ziegfeld Girls. Believe it or not, that’s the young Norma Shearer. No kidding. Now look again (if you haven’t already); try to match that gracefully arching back with the Norma you remember from The Women or Marie Antoinette. When her husband Irving Thalberg was overseeing The Great Ziegfeld at MGM in 1936, do you suppose Norma’s thoughts ever wandered to this photo session fifteen years or so earlier? Did she wonder what had become of the negatives and prints? Ethan Mordden’s books are full of surprises like that, although he doesn’t usually splash them across the front cover. And the surprises usually aren’t pictorial, either; Mordden’s books are well but not lavishly illustrated. 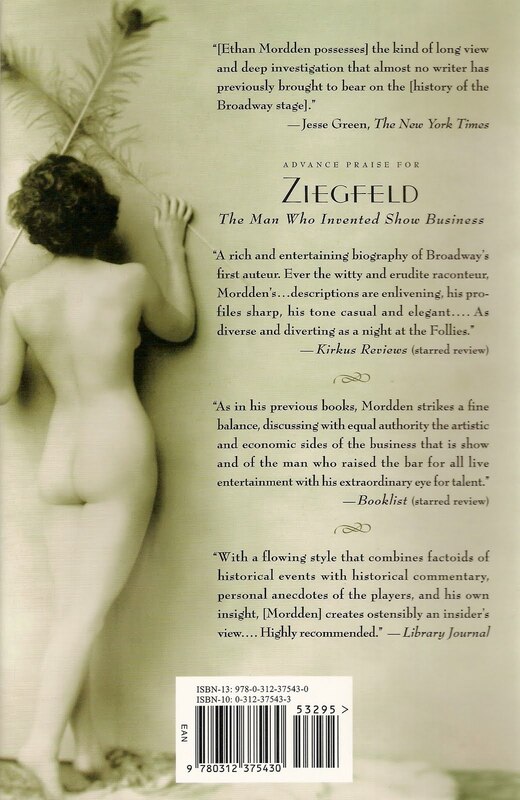 After all that, the very thought of a Mordden book about Florenz Ziegfeld is delicious — and the book fully delivers the feast that the thought promises. Mordden is a scholar, certainly, but he doesn’t write in a scholarly fashion; he’s offhand, chatty — even catty — and to read his account of Ziegfeld and his first wife, the belle epoque superstar Anna Held, motoring around New York in one of her beloved, newfangled automobiles is to feel like you’re there watching them pass. And he has a flair for the delightfully pithy: “Too often [in the 1900s], romantic shows dragged in jokes like a child pulling a yakking wooden duck.” “Ruby Keeler definitely had a lovable clunky something, but her performing skills per se were on the perfunctory side.” Or on the difference between the real Billie Burke, Ziegfeld’s second wife, and the Billie we know from movies like Dinner at Eight and The Wizard of Oz: “[T]hese films disguise the Billie who fell in love with Ziegfeld … Billie of the movies is a sharp comedienne playing a prattling human doily … Billie the Charles Frohman star was someone else entirely — younger, obviously, but keen, bold, and vivacious in a red-hair-and-blue-eyes coloring.” One of the ancillary pleasures of Ziegfeld is the long clear glimpse it gives us of the lady behind Glinda. There have been many books about Florenz Ziegfeld, beginning just months after his death in 1932, and Mordden gives them full credit in a long “Sources and Further Reading” epilogue to his book (don’t skip it thinking there’s nothing more to learn). There’s much that’s unknowable, and always was, about this intensely private, even secretive, man. Mordden’s subtitle tells us his approach: The Man Who Invented Show Business. By deep research and sharp analysis he gives us what feels like a personal insight into Ziegfeld the staid conservative revolutionary, the first producer to have four smash hits running on Broadway simultaneously, earning him the cover of Time on May 14, 1928. You had to actually do something to get the cover of Time in those days. Do something and be somebody. This book gives us a real grasp of who he was, what he did, and what drove and enabled him to do it. While I was reading Ziegfeld, I went to the post office on business. When I set the book down on the counter, the clerk glanced at it. “Ziegfeld. Is that the guy with the Follies?” Florenz Ziegfeld Jr. — and nearly everyone who knew him — had been dead a good forty years by the time this mailman was born. But he knew who Ziegfeld was — he even knew how to pronounce the name correctly. In Ziegfeld: The Man Who Invented Show Business, Ethan Mordden tells us why.